Wadworth pub with 4 of their ales - 6X, Horizon, Henry's IPA & Bishop's Tipple. As luck would have it, they also had a couple of real ciders - Weston's Old Rosie & Lilley's Crazy Goat. 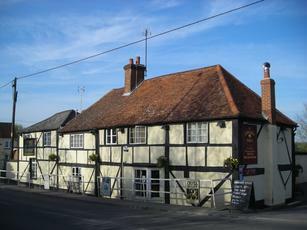 The pub itself is fairly unremarkable, apart from having a bit of character from its low beams and cosy rooms. I sat in the quieter front bar. There were a couple of other locals in the rear bar on my early Tuesday evening visit. Two-barred Wadworth pub seemly focussed on the food side, but with 8 real ales on tap. Low-lighting. Pint of St George & The Dragon was on the turn but was exchanged for a pint of Swordfish with no quibble. Seemed a little on the cool side but drinkable nonetheless. Much busier than the next-door Fox on both the wet and dry front. Well this has been done out in a half contempory half traditional way and they seem to have done their best to cover all aspects of the market, dining and drinking and entertainment. Probably good for food, and people that prefer a more contempory feel but for me it has lost all heart. There is a totally souless feel to the place which may be all down to the lighting. I'm not a fan of brightly lit places and this is not brightly lit but in trying to set the atmosphere they have failed by using low voltage lighting. Teamed up with the green painted interior it felt like sitting in a swamp or being in a fish tank that has not been cleaned for a while. Warmer lighting could transform it and give it some heart. The beer could be warmer too. After enjoying excellent beer straight from the barrel at the Morning Star, the Wadsworth's Boundary and Bishop's Tipple were overly chilled and tasteless. The place is all open plan and rangey mostly given over to dining, but not prohibitively so like some places, and there was some seating around the bar. I don't want to sound too negative as it was not all bad, it depends on what you like and they do seem to have tried to please most people. This is only my opinion, look at my profile and other posts to see where I am coming from, you may like all of the things I did not. 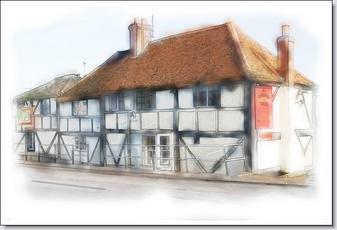 The staff, food, accommodation and appearance of the pub can not be faulted, all excellent in my opinion. However, the real ale wasn't up to scratch. I tried 4 of the Wadworth ales, the 'best' being Bishops Tipple. The others were too cold and lifeless. Would like to visit again if in the area, and hopefully try some guest ales if on. Also a good selection for the non real ale drinker, a few Dutch lagers & stowford cider.